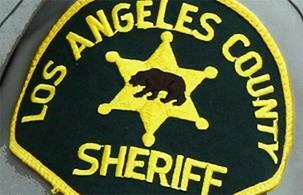 LOS ANGELES – Recently reinstated sheriff’s Deputy Caren Carl Mandoyan was a member of a secret society of deputies known as the Reapers and had their tattoo on an ankle, according to a report published Thursday. She said he warned her that because of his membership with the Reapers, he had influential friends who could ruin careers in the department. Mandoyan has become the focus of an intense legal battle between the county Board of Supervisors and Sheriff Alex Villanueva, who recently reinstated Mandoyan two years after the deputy was fired in connection with the woman’s claims of domestic abuse, stalking and harassment. The details are included in thousands of pages of documents from Mandoyan’s case obtained by The Times under a landmark police transparency law. The records include videos that showed Mandoyan attempting to break into the woman’s home. Mandoyan’s attorney, Greg Smith, told The Times any claims his client was involved in violence are “absolute rubbish” and that the deputy hasn’t been a member of the Reapers for years. Smith has also said his client did not abuse the woman, a former deputy. The new details of Mandoyan’s Reaper tattoo have merged two of the Sheriff’s Department’s most heated controversies — the reinstatement of Mandoyan and the department’s subculture of tattooed deputy gangs that have long been accused of severe hazing, fights and violence against the communities they serve. Mandoyan admitted to having a Reaper tattoo associated with the South Los Angeles Station, according to his July 14, 2016, internal affairs interview contained in 2,000 pages of documents that were released Wednesday by the county Civil Service Commission. The revelation comes days after Villanueva was grilled by members of the Sheriff Civilian Oversight Commission over his handling of members of tattooed deputy groups who engage in misconduct. Villanueva told commissioners on Tuesday that he replaced the captain of East Los Angeles Station and transferred several others in response to an off-duty fight that broke out involving members of the Banditos deputy clique in September. Several deputies filed a claim against the county earlier this month tied to that incident, alleging harassment and beatings by some of the Banditos. Villanueva and his newly appointed undersheriff, Timothy Murakami, also said Tuesday that department officials are actively discouraging new deputies from getting station-related tattoos because of their negative associations over the years. A Times review found more than $7 million in county payouts over the last decade in lawsuits claiming excessive force by deputies known to have matching tattoos as well as to settle a case alleging harassment by an inked deputy gang. Some watchdogs say news of Mandoyan’s association with the Reapers deepens their concerns about the department’s attitude toward secret societies and its commitment to investigating them. “I am troubled by the fact that Mandoyan identified the fact that he has a Reaper tattoo on his ankle and seemed to make light of the fact that it is merely a station tattoo for South L.A.,” Lael Rubin, a member of the Sheriff Civilian Oversight Commission who is part of the group’s ad hoc committee on secretive cliques, told The Times. 3 comments for "Reinstated deputy a member of secret society of Reapers"
Agreed. Truthfully, there should be a third party investigation and the entire department should be purged of badged gangsters. It doesn’t take a rocket scientist to identify the various gang tattoos that they sport. I have a Hello Kitty tattoo on my tailbone.